Shiraz by Marschall Groom of Barossa Valley. The new oak component is kept at a minimum allowing the vibrant fruit characters to elevate. Marschall Groom is the culmination of many years accumulated experience in the construct of Australia's most memorable vintages. 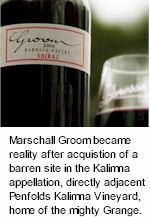 In 1997 the first acres on Marschall Groom's Kalimna Bush Block were planted to Shiraz, producing a crop for the 1999 vintage. This is an awesome, delicious Shiraz, a very focused, classy and beautifully structured wine. The Barossa Valley is the source of the world's finest Shiraz. With it’s hot, dry conditions and fairly level valley floor and undulating hills, this appellation is generally recognized as the best red wine district in Australia. The aim for the Groom label is to let the vineyards and fruit do the talking in producing the style and quality of wines. Marschall Groom's Kalimna property is located next door to the traditional Penfolds Grange mother source vineyard. The unforgiving soils of this area are well known to produce very low yields, loose clusters and extremely small berries. Classic, ultra premium Shiraz territory! Marschall Groom look for a little less wood than is typical of Australian Shiraz. A wine that is rich, but not overly jammy, tannic, or oaky in flavour so that it can show off the spicy, anise, berry flavors - true varietal characters in the grape. The aim is for a firm, fleshy structure and fine texture. The desired results are achieved by traditional and gentle winemaking methods, fermentation is in small batches, punched down in open top vessels, a skin maceration of only 6 days, minimal handling throughout and aging in American oak (half new, half 1 year old). Careful barrel selection increases the quality and consistency in red wines. In 2000, 8 acres of experimental Zinfandel vines were planted on the Kalimna Bush Block. Zinfandel is a hearty variety. It produces its best wines in areas where the grapevine needs to work hard. Marschall Groom's Kalimna shiraz vineyard has just the micro-climate to to produce wines that match California’s best. A very limited introductory release from these grapes was made for the 2003 vintage. 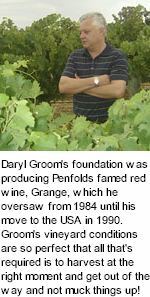 The first commercial release of Marschall Groom Zinfandel into the USA was the 2006 vintage. The Barossa Valley is too warm to grow world class Sauvignon Blanc. This variety is ideally suited to much cooler, higher rainfall climates. After thoroughly researching the climatic conditions within South Australia, a 20 acre vineyard in the Adelaide Hills appellation of Lenswood was planted to provide the perfect grapes for Sauvignon Blanc. The vineyard conditions are so perfect that all that's required is to harvest at the right moment and then get out of the way and not muck things up! What emerges from this clean, uncomplicated winemaking approach is a wine with brilliant acidity and flavours that balance citrus with floral. Brighter than California Sauvignon Blanc, and a little less pungent than New Zealand, this wine exemplifies the Adelaide Hills appellation as a world class Sauvignon Blanc producing region. The aim is to get the incredible, intense fruit flavours from the vine into the glass, pure Sauvignon fruit at its very best. As proprietors, Marschall Groom have set the foundation in choosing the most ideal viticultural region needed to produce the highest quality for each each varietal wine. Also working with the company to maintain and ensure quality standards is consultant Natasha Mooney, previously winemaker for E&E Black Pepper Shiraz, and now working closely with Daryl to produce stunning wines. All releases are hand crafted and produced in limited quantities.